For me, there is nothing more satisfying than planting a small plant in the ground and ultimately being able to harvest FOOD off of that plant. Tomatoes, peppers, eggplants, herbs, and many more! But whenever your plants struggle, and you do not harvest as much as you wanted, it can be frustrating. So order to increase your chances of success with your vegetable garden, here are a few tips. Vegetable plants require a well-drained soil. 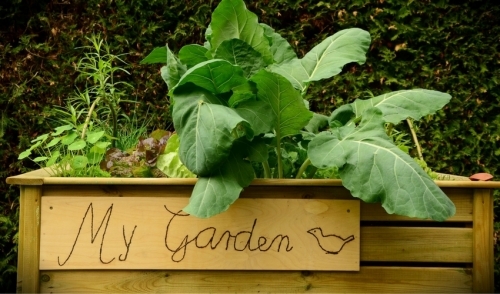 If the area where you prefer to plant your vegetable garden stays consistently wet, consider building up a raised bed, or planter box, on top of the area so that excess water will be able to drain out of the bed. Make sure that your garden is located in a very sunny area. Most, if not all, spring and summer vegetable plants will require the maximum amount of sunlight in order to yield a substantial crop. Well-drained soil and sunlight, two fairly basic things to consider for your vegetable garden. Now let’s get a little more technical and talk about soil structure, amendments and nutrients. If you are planting in a raised bed or planter box, I almost always recommend using a mixture of products to create your soil base. Garden soil is a pretty simple one – it has it in the name! Use it in the garden – vegetable garden, flower garden, herb garden. The garden soil gives soil structure where soils may be dense and compact, ultimately helping with drainage. On the hand, potting soil will help your raised bed or garden box to retain some extra moisture. You will want to be careful not to use too much potting soil so that the garden does not hold too much water. The potting soil will help reduce watering in the hot dry months of the year, and will also enhance the soil due to the peat moss, perlite, and vermiculite present in the potting soil. Adding a small amount of compost or cow manure is also extremely beneficial! It can encourage earth worm growth and development. It gives nutrition, or food, to the plants and helps to break up compact soils. Just be careful not to use too much – by nature, manures can be very high in zinc. Zinc is an element when present in very high levels can actually stunt the growth of your plants. And lastly, consider adding Calcium Nitrate to your garden. Calcium is an essential nutrient, in cell formation of fruits and vegetables. When plants produce fruits too quickly, concentrations of calcium may be too low for the fruits to fully develop. This physiological disorder is commonly referred to as ‘Blossom End Rot.’ And here in Louisiana, if you have ever planted a tomato or pepper plant, I am sure that you have experienced this issue. It is a fairly simple solution, but it requires you to be proactive. Once you notice Blossom End Rot, you will need to remove the affected fruits, and top dress your garden with Calcium Nitrate. But you can also be one step ahead of the game by adding Calcium Nitrate to the soil before you plant your garden. You may notice a theme here – Soil! Ultimately, the success of your vegetable garden will strongly depend on your soil. If you use the cheapest soil, with no amendments, and no food, you won’t be very successful. But, if you use good soil, amend it appropriately, and fertilize when needed, you will be setting yourself up for a bountiful garden!